news Highly acquisitive Internet service provider iiNet has revealed plans to buy Adelaide-based ISP Adam Internet, swooping in quickly on the company following the collapse of a controversial deal that would have seen it bought by Australia’s incumbent telco Telstra. Telstra first announced plans to buy Adam in October last year. However, even at that stage Telstra noted that the deal would be subject to approval by the Australian Competition and Consumer Commission, due to Telstra’s already strong position in the fixed-line broadband market, which the Adam Internet acquisition would further boost. Several weeks ago Telstra announced that it had abandoned plans to buy Adam Internet, as delays caused by the competition regulator’s concerns about the deal having caused its timeframe to have blown out. In a new statement issued this morning, rival ISP iiNet revealed that it had entered into a binding agreement to buy Adam Internet for a total of $60 million. The buyout will add some 70,000 broadband subscribers, plus a range of government and business clients, to iiNet’s total customer base, growing the company’s number of broadband services to over 900,000. iiNet expects to gain revenues of $55 million from the 2014 financial year from the Adam acquisition, with EBITDA being approximately $11.5 million. Greg Hicks, executive chairman and founder of Adam Internet said that the transaction represented a great outcome for Adam Internet customers and staff. “We believe that this transaction provides real benefit to Adam Internet’s customers and staff as it aligns them with iiNet, Australia’s leading ISP in customer service. Adam Internet has long provided customers with innovative products, high quality service and value for money, and this will be further strengthened under iiNet’s ownership,” said Hicks in iiNet’s statement. iiNet’s chief executive officer, Michael Malone, said the acquisition reinforced the company’s position as Australia’s second largest DSL Internet Service Provider (ISP) and the leading challenger in the telecommunications market. Completion of the acquisition is subject to a number of standard procedural conditions which are expected to be met by 31 August 2013, according to iiNet and the ACCC has already cleared the transaction. The acquisition will have the effect of dramatically consolidating South Australia’s broadband market into two main players, with Telstra having a large slice of the state and much of the remaining market share going to iiNet, through its Internode and now Adam brands. The move also dramatically removes one of iiNet’s main competitors in the state, Adam, from competing with its existing brands in South Australia. iiNet has rapidly consolidated Australia’s ISP market over the past several years. The company bought major rival Internode in December 2011, shortly after buying a substantial rival in Canberra, TransACT. It has also bought rival companies including Netspace, OzEmail, Westnet and the consumer division of AAPT, as well as dozens of other smaller telcos. In many cases, iiNet has removed each brands’ distinct product offerings from the market, replacing them with identical branded copies of its existing product lines. This has had the effect of removing competition in terms of different service offerings from the Australian broadband marketplace, and has led too iiNet being labelled the ‘iiBorg’ by some commentators, due to its habit, like the alien race from the science fiction TV series ‘Star Trek’, of assimilating all competition. iiNet has already flagged an opportunity to increase the bundled product offering to Adam customers “from iiNet’s existing product suite”, in this morning’s media release. If you specifically examine iiNet’s major acquisitions over the past half-decade or so, it seems clear that most of the buyouts have had at best a mildly negative impact on real-world competition in Australia’s telecommunications sector, while at worst they have removed a strong competitor from the market and removed a solid option from the list of choices of ISP which consumers have enjoyed. As Australia moves into the world of the National Broadband Network, we can thank iiNet for the fact that only a handful of major players will be providing services over the NBN. If iiNet had not bought the number of ISPs which it has, Australia would have a handful more of nimble, innovative players to provide services over the NBN — companies such as Netspace, Westnet, TransACT and Internode, all of which innovated strongly in the local broadband market before being acquired by iiNet. These companies provided consumers with strong alternatives to iiNet and other ISPs in Australia but have now been consolidated under the one umbrella, reducing real choice for consumers in the market. The mitigating factor when we look at iiNet’s acquisitive history in Australia, and its impact on competition, is that, as its regulatory chief Steve Dalby correctly noted, the company has acted as a very strong competitor towards larger, dominant rivals such as Telstra and Optus. Alongside TPG, iiNet provides a strong alternative to the majors when it comes to fixed telecommunications services. The launch of ADSL, ADSL2 and ADSL2+ services, the development of naked DSL and IP telephony, the increase in the quality of customer service, the provision of value-added services and the solidification of the process of migrating customers onto new ADSL infrastructure and off Telstra’s systems are all real improvements which Australian consumers can lay at iiNet’s door. Without iiNet, it is unclear what state of competition Australia’s telco sector would enjoy. Iinets business model is buying ISP’s, and making them more efficient through scale. Its cheaper for them to buy customers than to advertise and try and steal customers from those ISP’s. They’ve kept the staff from some of those ISP’s but in the long term they will be assimilated, you dont buy a company to keep operating it in the same manner. You buy it to improve it. You are dead set right about iinet having too many brands. YTou only have to look at the iiNet Group on Whirlpool. Someone asks a specifice question about say iiNet and reps from one of the other division fall over themselves to be the first to reply or suggest a fix. In my opinion it looks bloody awful that one of the other divisions cant let a representative of the specific brand deal with it or perhaps all iiNet and associated divisions get re-tagged as iiNet Group representatives might be a better look. The current situation just looks messy and unprofessional, all because there are too many brands. I think a huge strength for iiNet has been keeping the brands separate. While those of a technical persuasion are aware that Westnet, Internode, etc are all iiNet, many consumers still consider them separate companies – I’ve even had people try to correct me and assure me that Westnet and iiNet are competitors. It results in most non technical customers continuing to trust the brands they’ve grown to love, regardless of the owner. In my experience, the culture and people that made those companies great in the first place are still mostly maintained after the acquisition – iiNet do have a great culture and part of that is respecting and embracing the best parts of the organisations they acquire. Having seen a lot of acquisitions with local companies and multinationals, my personal view is iiNet are a model for how to do mergers and acquisitions right – they do it for the right reasons, the staff and customers are respected and treated right, the products, service levels and pricing are generally improved, if anything. Compare that to companies renowned for their acquisitive business models, like Computer Associates (CA), who assimilate everything into their own brand, retrench staff, cut off perceived redundancy and sell off hacked up decisions or simply shut them down. CA purchase to kill competition, acquire patents, technologies, products or a market position with existing customers and then turn everything into a regional CA office (or fold it into an existing one). THAT is the Borg. It is also the completely opposite approach to iiNet. like Computer Associates (CA), IINET assimilate everything into their own brand, HAS retrench staff, cut off given forced redundancy and sell off hacked up decisions or simply shut them down. CA purchase to kill competition, acquire backbones, network & data infrastructure technologies, products or a market position with existing customers and then turn everything into a regional IINET office (or fold it into an existing one). THAT is the Borg. It is also the completely approach to iiNet. To the outsider and customer its business as usual. Marketed to be a super happy fun time! Part of an acquisition/merger is improving efficiencies and removing redundancy, that is unavoidable. There’s a big difference between cherry picking a few tasty parts, chopping the rest out and discarding the hollowed out husk, and trying to improve an acquisition to play to the strengths that made it a successful brand to begin with and allowing it to continue to operate with much of the staff and culture that it had previously. No, I haven’t worked for iiNet or an acquired business, but I have lots of contacts both within iiNet and other ISPs that have become part of the group. I work with various ISPs on an almost daily basis from technical to administrative divisions and iiNet (and Internode) are streets ahead of other big players when it comes to customer facing services, employee satisfaction, corporate culture and even pricing – they provide the best technical solution, the best customer service (even at the corporate level where Telstra actually try to compete) and all at some of the most reasonable price points in the industry. I don’t know what your personal beef is, but I’m no fanboi – I care about service, reliability, technical solutions and then a company’s ability to support their products and customers. I care about results; I have no vested interest in the success of any particular ISP beyond the inconvenience of moving my own clients to a better service if their existing provider stops being reliable. iiNet (and particularly Internode) have proven themselves to my business for well over a decade. I have also worked for a multinational that was acquired by CA, so I do have direct experience there – I made the comparison because the two implementations for acquisition execution couldn’t be more different. CA’s business model is essentially acquisitions and mergers, they are hatchet men which is in stark contrast to an industry that is essentially creative, because for more than three decades they have roamed the planet gobbling up successful businesses and spitting out anemic CA clones of once great products and brands that then dwindle and fade because CA-borg businesses seem to lose all their creative and innovative talent, so CA go out and acquire some more companies to artificially boost their bottom line for another few years. Look, CA aren’t alone in this behaviour – it happens all the time in any industry you care to name. But the number of companies who are routinely acquiring and merging at the rate that iiNet are who aren’t renowned as hatchet men, who do manage to maintain acquisitions as companies with their own distinct identities and their own culture, who manage to do all of this without filling the industry with disgruntled ex-employees and retrenchment are truly few and far between. They may not be keeping absolutely everyone happy, there may be necessary retrenchment and efficiency measures, but how they manage to reconcile their need for elimination of redundancy, increased efficiency and bottom line growth for shareholders while managing to maintain morale and a positive culture within acquired businesses is a lesson in management and exceptional corporate conduct that, you cannot deny, had resulted in an exceptionally successful and profitable business. Sheesh – who is applying for a PR job at iiNet. You start by saying you have no idea how iiNet work in these situations, yet write a treatise on how wonderful they are. Good luck with your job app. Good luck with your job app. Although I might suggest a little more research (but the outcome of that may kill your employment prospects). And you consider that ill-researched (un-researched) blather was of some value in this discussion. I guess that is YOUR opinion (but it is not fact). Weren’t you long gone from Internode by the time of the iiNet acquisition? 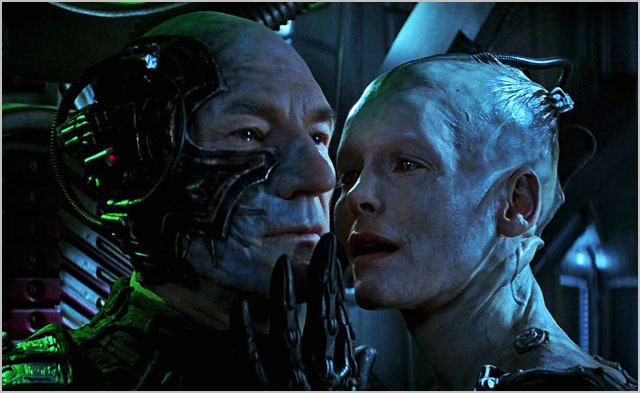 Now if only iinet got into mobile phone towers, instead of buy wholesale of Optus it will be an unstoppable Borg! I know re: the Star Trek pic. I just leave that credit in there because it helps me prove every time how geeky Delimiter’s audience is ;) I love First Contact, it’s one of my favourite films. ISP business is consolidating, because at this point it’s almost irrelevant which Party leads after the next election, NBNco will be the chosen network provider. Of the companies to take over Adam, iiNet is probably the closest fit, at least from an external observation. It (consolidation) was predicted. It’s happening. It’s pretty much an expected outcome given the ACCC’s decision over POI. Adam won’t be the last. For those mourning Infrastructure based Competition, it was doomed to failure by a schizophrenic watch-dog and a monopoly owner whom had been sold outright, with little regard for the consequences. iiNet are slowly consolidating their way all over South Australia. Are their any Adelaide based ISP’s left? Adams customers can look forward to congestion, P2P shaping, plan / service stuffups and incompetent, foreign based poorly trained customer support that is just a little better than Bigpond. Recently signed up for a supposed 100Mb/s HFC plan that is constantly P2P shaped and at the best of times struggles to get more than 1MB/s throughput. Phone service has been mistakenly disconnected on three occasions, each time waiting over 30 minutes to talk to a nuffy who struggled to resolve the problem. Seriously? I’m on 100mbit NBN and easily max my line out on P2P. What estate are you in? Is it actual NBN or 3rd party FTTH? He said it was HFC, not NBN or FTTH. Although I think by this point you’ve probably realised that. I’m with Amnet in Western Australia. I had a friend introduce them to me, they are the first ISP I’ve paid for myself and I haven’t changed ISPs since. The customer service and tech support is as good as it gets. Of course, it helps that I have a couple friends who now work there. The prices/quotas are extremely competitive too, especially since they recently simplified their plan structure. Enough of my bitching though, back to iiBorg (sort of), I think Amnet have a large business and government customer base as its parent Amcom, so I don’t expect an acquisition by iinet or anyone else. So in WA, at least, there’ll be decent competition. Jim – After spending over 2.5 years with iiNet in Brisbane (Naked ADSL2), I can honestly say there wasn’t an issue with speed. Latency to the US was a bit poor (eg 250ms) but download speeds were generally 1.6MB/s(on a ~18000 line sync) not including the other computers and devices connected to it. As for the foreign customer service reps, I can’t think of one large company that doesn’t have overseas call centres. Unfortunately, even those call centres in Australia are obliged to work from a step by step script which really limits their ability to be helpful. Is this a Joke or what , at this rate it will only be Telstra ,Opus, iinet & TPG left as ISP , The ACCC is a Joke letting this happen , The ACCC stopped Telstra buying them , but not iiNet why? Hey all, I’ve just enabled a fairly simple new caching system on Delimiter; let me know if you see any weirdness in terms of the site not updating properly and so on. I’m posting this comment on a couple of active threads right now. Don’t know if it’s intentional, but I’m getting white text on black background when I log on using Firefox. Clicking “continue” returns things to normal. Interesting … screenshot? I’m not seeing it on Firefox on my end. It may have something to do with the weekly newsletter popup, which uses Lightbox etc. It might have been a quirk of filtering software. I did see weird layout oddness for a few mins on my phone – made the site almost unreadable as it squashed text into a tiny column. Refreshing fixed it, though. We don’t really mind being called the Borg (it’s fun) but to suggest that forty-odd ISPs acquired by us would still be independently trading, if we didn’t welcome them into the ii-collective, is just wrong. This isn’t a crack at Delimiter, it seems to be a fairly broad attitude represented in a few places – that iiNet is somehow forcibly sweeping up the competition – without acknowledging that the ‘competition’ actually starts the process by saying “Buy me, please”. Given that those businesses were all on the market, with their owners usually looking to ‘get out’ for a variety of financial reasons, it follows that many would be part of some other ‘Borg’ or simply wound up, without iiNet’s participation. If that is correct, then any suggestions that our acquisitive behaviour ‘harms competition’ is a bit silly. It’s actually a rescue mission. I’m not saying that you’re wrong. Clearly you’re not. But I will say that many Australian technologists feel that a broadband market composed primarily of three premium players (Telstra, Optus and iiNet) and one cut-price player (TPG), does not reflect a good level of competition, and that there were more options out there for the consumer dollar before you guys bought Netspace, Internode, Westnet, TransACT, AAPT, OzEmail and now Adam. iiNet has been both bad and good for competition — and those two aspects do not cancel each other out. This situation will now be particularly apparent to South Australians, who have just seen their two major ISPs bought out by the same company. I guess it’s a matter of perspective. The view above suggests that it is iiNet controlling the market consolidation. My own view is that the consolidation would have occurred even without our participation, so it’s hard to accept your proposition that ‘iiNet is bad for competition’. iiNet has taken the opportunities as they present themselves. Unlike the ‘real’ Borg, we haven’t assimilated other ISPs against their wishes, with them fighting and resisting our advances, but eventually succumbing to our implacable force. Nobody has ever been forced by iiNet to sell their ISP to us. In that respect, it’s a totally wrong analogy. Maybe economics is bad for competition, maybe the Australian consumer is bad for competition, maybe the market is bad for competition. Maybe whatever put pressure on those dozens of ISPs that felt the need to put their businesses up for sale should be more appropriately blamed for their exit from the market – who knows ? We just provided an exit route, when they wanted one. Steve, the ‘Borg’ analogy is not because iiNet takes over ISPs without their permission. It’s because you take over ISPs and then homogenise their products with your own. Nobody forced iiNet to make the products of Netspace, Westnet etc the same as its own. iiNet could have owned those companies but still left their product managers with the power to make product decisions. Instead, iiNet homogenised their product lines, meaning there is no difference between buying the same product from iiNet or Netspace, although the Netspace brand is still in-market. Where some acquisitions had product aspects that iiNet did not (such as Internode’s lack of on-peak/off-peak data structuring), iiNet assimilated those improvements into its own plans and then extended those improvements out amongst all its brands — just like the Borg. I know that iiNet is acting here from rational self-interest. That’s fine, and it’s a fundamental tenet of capitalism. I will support iiNet against the incumbent any day, because iiNet is a much better, friendlier company. But what I don’t like about all this is the attitude of hurt innocence that iiNet projects. Well, no. Adam’s deal with Telstra failed, and iiNet quickly, like a raptor, swooped in to make a counter-offer. And eventually, the Adam culture and products which its customers like will be subsumed into iiNet, leaving only the Adam brand like a husk. iiNet’s done a lot of good. But it’s not a non-profit entity. It acts for its own good primarily — as with all corporations. It has to. But this doesn’t always sit comfortably with consumers sometimes, and there is a debate to be had about whether we have enough independent ISPs to ensure a competitive market. iiNet likes to pretend that it’s just another nice neighbourhood company. But the reality is, that as it grows larger and larger, it becomes less and less flexible and more and more like the telcos it grew up fighting. Is there much difference these days in the corporate culture of iiNet and Optus, for example? Not terribly much, from my perspective. > Well, no. Adam’s deal with Telstra failed, and iiNet quickly, like a raptor, swooped in to make a counter-offer. And eventually, the Adam culture and products which its customers like will be subsumed into iiNet, leaving only the Adam brand like a husk. >> there is a debate to be had about whether we have enough independent ISPs to ensure a competitive market. While that hypothetical runs its course, the real world moves on. My point (which you have ignored) is that the “independent ISPs” as you put it, are voluntarily bailing out. > We just provided an exit route, when they wanted one. Why is it you’re okay with either of them buying it out, yet not okay with iinet buying it out, exactly? Buying Adam will reduce competitors. You just make stuff up. Bit pointless, really. Steve, it doesn’t look to me like Adam was dying to be bought — it looks to me like you guys dove in. Renai, half of Australia’s landmass could crawl across the ocean into the US, faster than Telstra could agree to a deal. Refer, well, all of the agreements over pretty much everything since incorporporation. Adam’s owner could have simply said “no”, to iiNet, right? AFR is attempting to paint as a shotgun wedding, yet the entire discussion seems to have indeed been on and off for some time..
I’ve seen the inside of a few iiNet acquisitions, and let me tell you, while they’re not shotgun weddings, there is no doubt the relationship is consummated quickly ;) They move very fast and at the right time.